Sid Meier's PIRATES, PC CD-Rom, Original version Atari . Condition is Like New. Dispatched with Royal Mail 1st Class Large Letter. In working order. case has some wear as it was a game that was played a fair amount. For sale is a PC games bundle, Included is the following: Battlezone 2 Big Box (German version) Children of the Nile Flight Unlimited III (Brand New Sealed) Casino Tycoon Dogz 5 Neverwinter Nights B17 Flying Fortress Thanks for looking! Genre: Arcade. ALL OTHER INFORMATION. CONDITION & ITEM INFORMATION. Region Information Key. 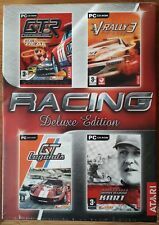 You are buying a copy of Test Drive Unlimited 2 for PC in excellent condition. There are no scratches to the disk as can be seen in the photos, the case and manual are also in excellent condition. Any questions please feel free to ask. The box and contents are in very good/like new condition. (bedr/glass/c/2nd/draw). The discs look like new. Unreal Tournament 2003 (PC: Mac/ Windows, 2002). Condition is Acceptable. Dispatched with Royal Mail 1st Class Large Letter. • Exclusive content - Mods only available with this version. New Arrivals. Useful Links. GTR 2 GTR EVOLUTION Pc. GTR Evolution -. Rear Wheel Drive, over 600hp in 1000kg cars with extended body-kits: these beasts will give GT cars a run for their money. 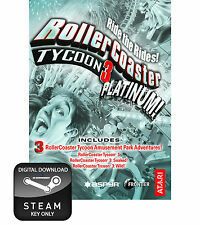 Rollercoaster Roller Coaster Tycoon 3 Platinum! EAN 5051292100324. Works on OS 10.7 & 10.8. not tested on 10.9 or 10.10 (may require an update). RollerCoaster Tycoon 3 with Soaked! Hop aboard any ride and experience every spine-tingling detail of modern coaster technology from any angle! Modem play 28.8 baud modem. Minimum specs as taken from box SVGA 2MB video ram minimum. Baldur's Gate 2 - Throne of Bhaal -. A storm of chaos and destruction thunders across the Sword Coast, towns are laid to waste and great cities burn. Create a new character or import your Baldur's Gate character into Baldur's Gate II. 18 PC Games Bundle kept in great condition, The Sims deluxe edition, Harry Potter and the philosophers stone, Atari anniversary edition, elder Scrolls 3 morrowind, starcraft, gangsters, tron 2.0, zoo vet, chicken run, dogz, dogz 4, catz 5, 555 games, jewel quest solitare trio, brain busting games for windows, arcade games for windows over 100 classic games, empress of the deep, Tom and Jerry fists of furry, Disney's Atlantis the lost empire activity centre and command and conquer tiberian sun. game activation codes of course for each one included. Add to Favourites. VERY RARE = VR. Rollercoaster Tycoon 2 - GOLD EDITION Pc Cd-Rom. Wacky Worlds. Multiple them worlds including Pirate Land, Wild West and Water World, and many others. Famous landmarks to fill your parks such as the Eiffel Tower, Big Ben, Great Wall of China, Statue of Liberty and more! THE WITCHER ENHANCED EDITION. Map ( i dont think it has been taken out of box ). Disks very good (5) complete. Books very good (3). 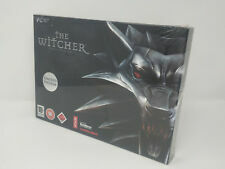 The Witcher - Enhanced Edition - Boxed Version Pc. Enhanced Edition Features -. 2 new adventures - The Prince Of Neutrality and Side Effect. Powerful D'Jinni Adventure Editor lets you create your own spellbinding adventures. We are a team of nine based in a 2,500 sq/ft unit in a gated industrial park in South Manchester, UK. Product Summary. Includes outer card box and installation code on sleeve. Original UK version, complete with case, covers and instructions. 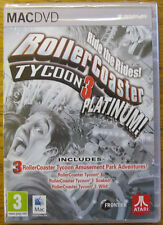 Rollercoaster Tycoon 2 Deluxe - Inc 2 add-Ons Pc Cd-Rom. Wacky Worlds. Multiple them worlds including Pirate Land, Wild West and Water World, and many others. Experience a Jurassic safari, confront a mythical skeleton army and relive the golden age of Rock n' Roll. The heart of Test Drive Unlimited is the online mode. It also provides access to player-created matches shown on the map screen. Creating a race here also works in the singleplayer modes. At any location, the start and finish can be defined, as well as the type of the race, which type/classes of cars or bikes are allowed and how many people can participate. The inevitable battle between man and machine has begun. Rise of the Machines. But choose your allegiance carefully. The future of humanity lies in the balance. Runs on Windows. 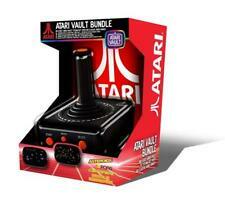 By Atari 2003. Humanity Sits on the Brink of Extinction. Fully Complete with 36 page manual and Serial Code. Unique single seater action. Disc Only in a CD Case. Wield your sword, engage your mind, use your crew. Dispatch landing parties of buccaneers to take over entire cities in strategic battles. NEVERWINTER NIGHTS - ORIGINAL RARE SMALL BOX EDITION. A plague known as the Wailing Death is terrorising the city of Neverwinter. Lady Aribeth summons an adventurer, who teams up with her fiance Fenthick Moss and his friend Desther to capture four monsters which are needed to prepare the cure. Enter the Matrix. The Creatures of the Matrix Trilogy. Runs on Windows. 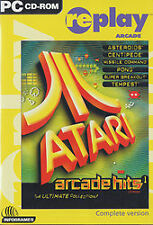 By Atari 2003. Includes Original Manual.